“Central Office Re-architected as a Datacenter (CORD)” is a new design of a telco central office that replaces closed and proprietary hardware with software running on commodity servers, switches, and access devices. Analytics-CORD is an environment that provides tools for applications to program or actuate target probe primitives such as Broadcom based network switches. BroadView Instrumentation is a software suite that enables advanced network analytics in a platform agnostic manner. BroadView Instrumentation provides deep observability of switches and network fabric in A-CORD environment. In this webinar, we will discuss CORD architecture, A-CORD framework and how BroadView Agent integrated w/ A-CORD enables closed feedback loop in service provider networks. We will further discuss how BroadView Agent supports A-CORD use cases such as network level packet trace profile, end-to-end latency computation for real-time traffic, micro-burst detection and scalable monitoring of network fabric to prevent congestion. Next generation packet transport networks (PTN) with a focus on Multi-protocol Label Switching Transport Profile (MPLS-TP) are becoming popular for service providers looking to deploy Software Defined Networks by leveraging OpenFlow and its extensions over a growing diversity of networking systems. One of the largest carriers in the world, CMCC has come up with an overall system specification for its software defined PTN (SPTN) using an OpenFlow southbound interface (SBI). This presentation covers the high level specification and design considerations for a centralized PTN controller and implementing MPLS-TP technologies over OpenFlow in a service provider’s packet transport networks. It will also discuss the TTP extensions, developed by China Mobile and their partners, including key contributor Broadcom, to support this end-to-end use case. The webinar will further discuss the open software developed to run on existing switching silicon which can be deployed in a backhaul network. How to ensure application SLAs in your cloud networks? Tracing packet flows and root causing issues are very complicated in cloud networks by virtue of technologies involved, further complicating application SLA compliance in cloud networks. Multi-tenant networks is one of the major use cases of cloud networks. Ensuring application SLAs is a very critical aspect of multi-tenant networks as various applications/organizations share the same physical and virtual infrastructure resources. Naturally, monitoring and tracing packet flows both in the overlay as well as underlay becomes a critical piece of any solution that attempts to provide complete overlay mapping with underlay. In this session, we will explain how BroadView integrated with Cumulus Linux and Plumgrid enable network administrators a single pane of glass to monitor all aspects of the network facilitating easier mapping of overlay packet flows with underlay networking infrastructure. We will also discuss scalability aspects of the solution. Visibility and telemetry are becoming very important in datacenter networks. Traditional telemetry methods, such as SNMP, do not scale to meet the requirements of the next generation networks. New network paradigms, such as SDN, leverage telemetry streaming to offer predictive analytics and automatic remediation. OpenSwitch is a community-based open-sourced full-featured network operating system. BroadView is a software suite that enables advanced analytics in a platform agnostic manner. BroadView and OpenSwitch collaborated to enable open, scalable and advanced telemetry solutions. 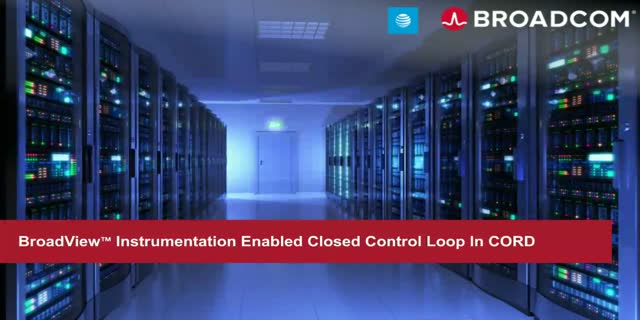 In this webinar, we will discuss the benefits of a “BroadView integrated OpenSwitch” instrumentation solution and explain how use cases, such as telemetry streaming, can be enabled using this solution. • the specific use case of a SDN based leaf-spine fabric built with bare-metal OCP hardware (using Broadcom switching silicon) and open source switch software, built on top of Broadcom provided SDN reference software, Open Flow Data Plane Abstraction (OF-DPA). • L3 forwarding across racks using MPLS labels between leaf and spine switches, with support for QinQ and IP multicast.